Despite the awful title Can You Get Hooked on Lip Balm? by Perry Romanowski is actually a really good read that challenges what we think we know about beauty products in particular parabens, sulphates, "natural" cosmetics, and the marketing behind the brands. Can You Get Hooked on Lip Balm? stands as an introduction to the science behind beauty (you can read a lot more articles on the Beauty Brains website); if you like challenging what you think you know about beauty products, you should read this book. A Monster Calls by Patrick Ness is a super beautiful contemporary tale about learning to grieve. A monster visits a young boy to tell him three stories, when the final story is told the boy must tell his own or the beast will eat him. There is no denying the simplicity of the writing style since this is a book written for children, yet it remains profound nonetheless in a dark and ever so slightly twisted way. Your previous post about mineral oil really made me want to better research the ingredients in cosmetics. 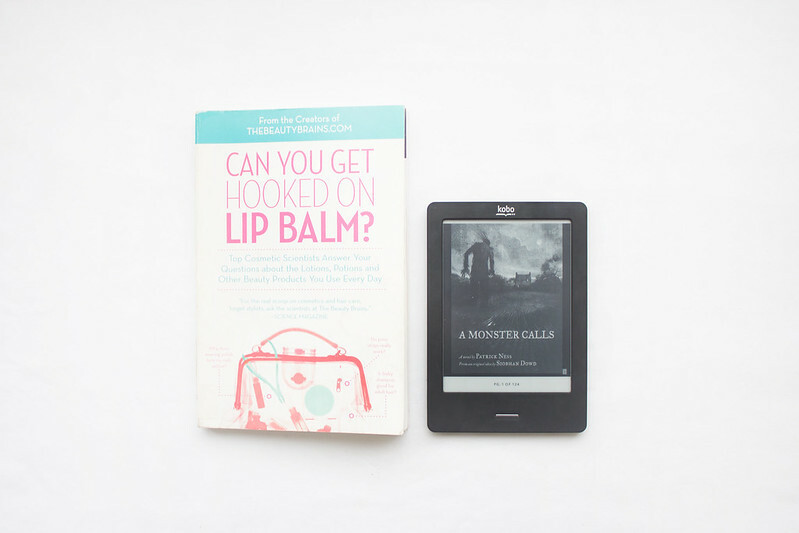 Since you recommend Can You Get Hooked on Lip Balm, I'm adding it to my read list! You're the first person who also reads Beauty Brains! Love their website. So informative and interesting. The first book you suggested is quite interesting. Put it on my book wishlist! Btw you should check out the book Gone Girl by someone with last name Flynn? Forgot first name but it's such a scary thriller but so awesome. If mineral oil in cosmetics interests you, you should check out Caroline Hirons blog. She talks a lot about it and how you should avoid it. She's highly recommended. I actually wrote a post on mineral oil.. I did a lot of research. I respect Caroline Hirons and a lot of what she says really works, HOWEVER, I really do not like this vilification of mineral oil. There is absolutely nothing wrong with it but just like every other cosmetic ingredient, what works for one person might not work for someone else - that doesn't mean it's "bad." People often bad mouth a lot of ingredients without any knowledge on the subject, which I think is incredibly dangerous - that includes myself. I was surprised about how little I knew about cosmetic ingredients, that's why I've started researching and discovering a lot of misconceptions about ingredients. I'm going to be writing a few posts on this subject because I feel like there are a lot of misinformed people reciting things they have read online without actually reading anything about it. A Monster Calls sounds wonderful, like a old-time fairy tale in a way! Definitely going to check it out! This book was REALLY good at busting some of the myths people (especially lately) keep citing. It has a lot of useful information especially about the "natural" cosmetic industry. VERY interesting. SO SO SO SO GOOD! I wish more people read it, then maybe they would stop reciting myths they've read online. I've started reading the ingredients lists on my cosmetic/skin care products and I'm making quite a few discoveries.. especially in regards to "natural" products. It's a real quick read too, only 200 or so pages. Agreed. Look forward to yours post. Can You Get Hooked on Lip Balm? looks like a great read... I do feel that a lot of undue vilification of ingredients happens in the beauty world. Going to check out the Beauty Brains website!